This week, as a result of a message from a reader, we have a look at the third-party travel operators who deal in selling products by offering “free cruises” as bate. Primarily concentrated on 2-night sailings out of Florida, these companies have created a bad taste for many consumers. As some would say, there is no such thing as a free cruise. And with Royal Caribbean’s Quantum and Anthem of the Seas stealing the spotlight with their North Star capsules, we look at Carnival’s SkyRide, a suspended outdoor cycling trip around the top of the ship. So You’ve Won A Free Cruise, Have You? I was curious if you had any history on Caribbean Cruise Line being bought out by Holiday Cruise Lines. I am having difficulty verifying who Holiday Cruise Lines is. Unfortunately, we live in an era where there are lots of scams including cruise line scams. I called my original 800 – 221 – 8200 phone line for Caribbean Cruise Line only to find out that the number is now owned by Holiday Cruise Lines. I did give Holiday Cruise Lines my reservation for the Bahamas cruise and there was some information but there was also some discrepancy. I have been told to call 800-219-8695 to make reservations with Holiday Cruise Line after I found their company sales line. I was also given a website for Holiday Cruise Line that was up for a few days and then disappeared. I would truly appreciate your help by email or feel free to call me. I also wanted to mention that the Caribbean Cruise Line ship is the MS Bahamas Celebration and the Holiday Cruise Lines ship is the MS Grand Celebration. I would deeply appreciate any information you can give me to provide verifications of both my former and supposedly future Cruise Line ships that I have already paid for to a trip to the Bahamas. The original trip that I bought includes a stay in the Bahamas for three days and two nights, two days and two nights in Fort Lauderdale and two days and two nights in Orlando. Concerned cruise customer. This sort of activity has been taking place with third party operators since the days of Imperial Majesty Cruise Line when it operated the 905-berth veteran Regal Empress (built 1953) and one only has to Google up “Caribbean Cruise Line” to see that such companies operate using unsolicited phone calls throughout North America, awarding free cruises and then charging service fees and add-on accommodations, and sometimes forcing clients to attend timeshare sessions. The way that this is done, using high-pressure sales and then refusing refunds, generates lots of complaints about the way they do business. The story that Caribbean Cruise Line been taken over by Holiday Cruise Lines has been circulating since at least 2010, when Cruise Law News circulated the same information. But last month, the same source suggested that Caribbean Cruise Line may have “gone out of business” (in their words) with the grounding of the 1,004-berth Bahamas Celebration off Freeport in October. Over the years there have been many complaints about the way these companies operate, sometimes accompanied by reports of successful voyages, possibly filed by friends. One should always be careful when booking unsolicited holidays. But for the information of readers who may not be aware, the actual operators of the Bahamas Celebration were Celebration Cruise Lines and the operators of the replacement ship, the 1,494-berth Grand Celebration, are Bahamas Paradise Cruise Lines, some of whose shareholders and management are the same today as the previous company. One must also be careful however as Caribbean Cruise Line was located at 2419 East Commercial Blvd in Fort Lauderdale and although they happened to be located in separate suites on different floors of the same building, this also happens to be the location of Bahamas Paradise Cruise Lines today. It was also the address of Imperial Majesty Cruise Lines and Celebration Cruise Lines before that. Holiday Cruise Lines meanwhile were located in Fort Lauderdale then moved to West Palm Beach but are now hiring staff for a new location in Delray. Thousands of protests and complains circle around these operations as they run on a business model that relies on getting customers interested by offering a “free” product or service in order to sell more product and meanwhile collecting “port fees” for the cruise at the same time. If a cruise is going to be free, then these two-night cruises from Palm Beach to Freeport count as some of the cheapest in the world. 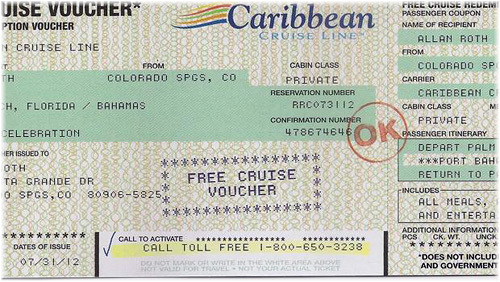 Holiday Cruise Lines Telemarketer offering free cruise. Wanted a CC#. Asked how they got cell number and she said MC, VISA or the like. Asked for supervisor and got disconnected. The surviving cruise line operating the Grand Encounter is Bahamas Paradise Cruise Line and it is recommended that the public deal direct with that line through an authorized travel agent and not with a third part travel operator. Bahamas Paradise Cruise Lines also now sell packages that include stays at the Grand Lucaya Resort in Freeport. Meanwhile, with the number of complaints being caused by these fast buck sellers it is amazing that the State of Florida, which has jurisdiction over travel, cannot regulate this industry better. One can only hope that it does not increase with the almost 50% rise in cruise capacity on the Freeport route. To be installed in Carnival Cruise Line’s new 3,954-berth Carnival Vista, the new SkyRide is a bike of sorts suspended 150 feet above the sea. Riders pedal the recumbent-like bikes around an 800-foot-long suspended track with panoramic views. 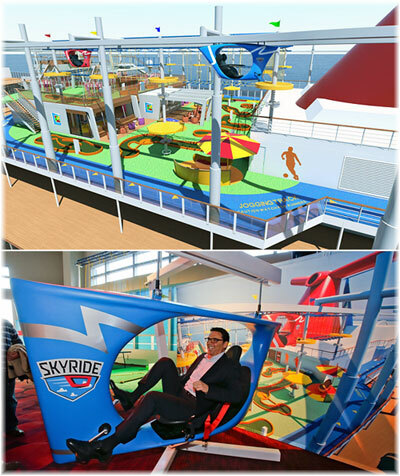 The SkyRide will be part of an expanded version of the outdoor activity parks that Carnival has installed on recent ships that will also include a suspended ropes course. The area will have a new indoor sports facility, The Clubhouse at Sport Square, which will also feature mini-bowling, ping-pong, arcade basketball and sports video gaming. The new ship will enter service in the Mediterranean on May 1, 2016. In keeping with the line’s slogan of “The Fun Ships,” it will feature an array of amusements, including the open-air SkyRide and the line’s largest water park with a water tube slide that’s more than 450 feet long. The Vista will sail eighteen Mediterranean voyages before setting off on a 13-night Transatlantic crossing on October 21, 2016. Following three cruises out of New York, Carnival’s newest and largest cruise ship will sail a variety of Caribbean cruises out of its new home port of Miami starting in November 2016. Sailings will range from three to seven nights and include Eastern, Western and Southern Caribbean itineraries, with sailing dates released through to April 2017. Prior to heading for Miami, Vista will sail a two-night cruise to nowhere from New York City on November 4, 2016, followed by a 10-night Eastern Caribbean cruise. It will then reposition from New York to Miami with a 10-night Southern Caribbean sailing stopping in Grand Turk, Bonaire, Aruba and St Maarten on the way.